Ordered free and free p&p. Doesn't have much info on contents though. I'll see what I get. Heat added. Ordered free and free p&p. Doesn't have much info on contents though. I'll …Ordered free and free p&p. Doesn't have much info on contents though. I'll see what I get. Heat added. 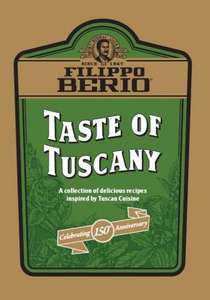 You can download a selection of booklets including one called "Taste of Tuscany". Not sure if it's the same one as the hard copy. Got it. Nice booklet. Paperback. Thick, glossy pages. Useful recipes. Of course nice Olive oil in the stock is essential.